I made the Healthy Fruit Muffins and thought that they were yummy, but I wanted to branch out a bit and try some different flavours. Lemon and blueberry go really well together, so I thought lemon and blueberry muffins would be lush. Three Syns per muffin. And they’re scrummy. Making them is easy. Roughly crush the All-Bran, add the blueberries, sweetener and lemon juice to it and mix well. Then sieve in the flour and the baking powder and add in the zest of the two lemons before pouring in the eggs. 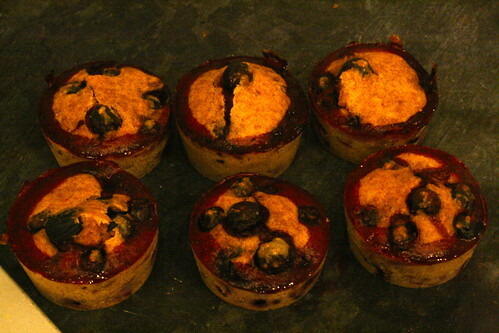 Then mix together, spoon into 6 muffin cases and bake in an oven pre-heated at 190C for 15-20 minutes. They should be risen and the top will be firm. If you need any help, the method is pretty much the same as the original Healthy Fruit Muffins recipe — that page has more pictures and step by step instructions if you need help. But they’re super easy, so you shouldn’t do. I made these muffins today. I was really disappointed with them. They were very unpleasant.